When a USB mass storage device is connected, folders and files can be shared with connected devices on the Jetpack's Wi-Fi network. Only the USB type-C port can be used for sharing. The USB type-A port is available solely for charging a phone or other portable devices. A USB type-A to USB type-C connector can be used to connect a USB-type A mass storage device. 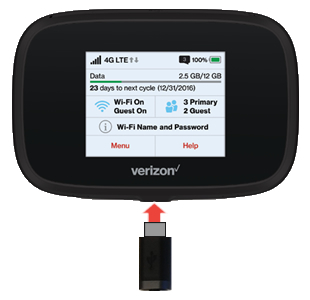 A connector isn't included with the Jetpack, but can be purchased via a 3rd party (non-Verizon) retail store. With the Jetpack powered on, connect a mass storage device to the Jetpack's USB type-C port located on the bottom edge. Allow several seconds for the Jetpack to recognize the storage device. From the Jetpack's display, tap Share. To safely remove the storage device, navigate: Menu > MiFi Share > Eject then tap Confirm.